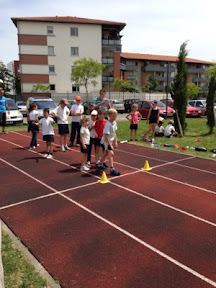 On Friday the children's school had sports day which the kids were all excited about. Hannah went just for the morning as per usual but interestingly enough some of the teachers remarked to the teacher aide that they thought it would have been nice if she could stay for the whole day. Her team were also a bit disappointed that she was going home as she is such a good runner and climber! It was such a hot day that I think Hannah was quite happy to come home for a couple of hours. We went back at 2.30 to watch Jasper and Penelope in their teams. When it came to the medal giving ceremony and the adding up of team points Hannah's team came in second. 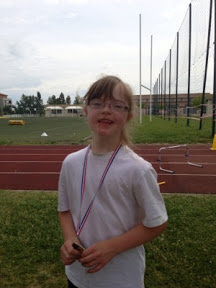 She was very proud to go and receive a medal with the rest of her team. Penelope's team got fourth and jasper's seventh - so they all did very well. 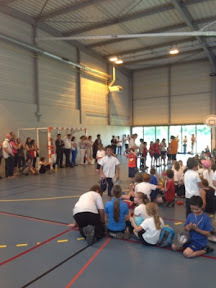 I do find it very frustrating that the school has no flexibility where Hannah is concerned and I do not understand why she could not have been allowed to be there for the whole of the sports day. The way the management treat Hannah is quite appalling and they don't seem to have any idea as to how inclusion works. 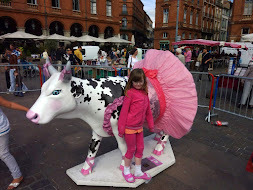 Last Tuesday the year 5 and 6 classes went into toulouse and both Hannah's teacher aide and I had to go with Hannah - not sure what they thought she was going to do! Worse though is that this Tuesday the yr 5 and 6's are going rowing and Hannah is not allowed to go! 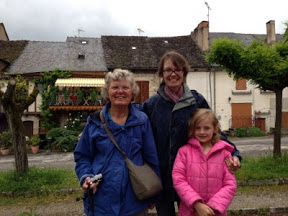 Mum, Hannah and I are going to go to Auch instead which will be lovely. As it was such a hot day on Friday when we got home we got into our togs and jumped into the pool - finally it was hot enough! 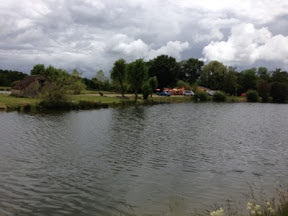 The hot weather was short lived though as we awoke to rain on Saturday. 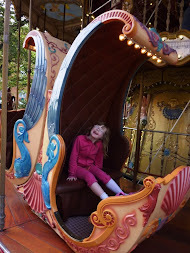 It was a busy day of ferrying kids to and from different activities - Penelope and Hannah had dance, Hannah had her girl guides cupcake challenge district day and Penelope had a birthday party. I find it ironic that trained professionals seem incapable of having Hannah at school unsupervised yet the lovely girl guide leaders are more then happy to have Hannah without extra supervision! On top of all that running around James was busy helping friends move so thankfully mum was here to hold down the fort. We awoke this morning to yet more rain but decided to carry on with our plan to drive north to Albi. 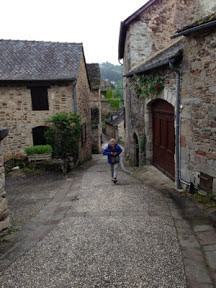 James had been on a bus tour when he came over last July and so wanted to retrace his footsteps and go back to some of the lovely towns he had seen. 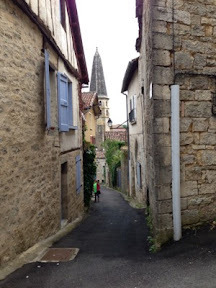 The first town on the route was Caylus which is a lovely little town on a hillside with a gorgeous Cathedral. We met the lovely local French priest who gave us a bit of history about the 14th century cathedral. We continued along the road heading for Najac but were all starting to get hungry so were on the look out for a nice restaurant for lunch. 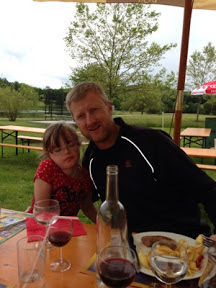 We drove through a little village called Parisot and saw a sign in the middle of nowhere pointing to a lake with a restaurant open sign. We thought we'd give it a go and found a purpose built wooden cafe by the lake with plastic chairs and tables plus a few benches outside. 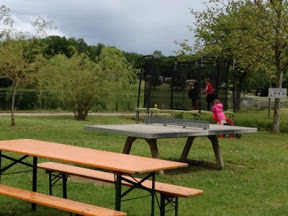 The kids were thrilled that there was a trampoline and a playground and went off to play while we ordered. 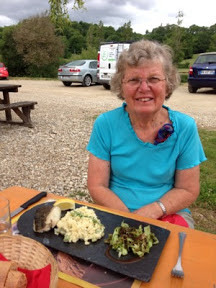 Mum is loving the French plat du jour which includes an entree, main, dessert and coffee plus bread and our little cafe by the lake did not disappoint. 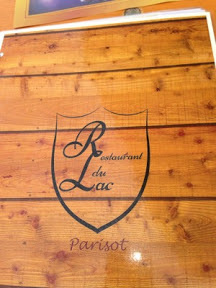 We loved this restaurant - beautiful food, great service and a beautiful setting and will definitely be going back. 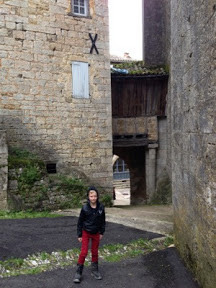 We got back in the car after our two hour lunch (am embracing the French way) and headed to Najac. 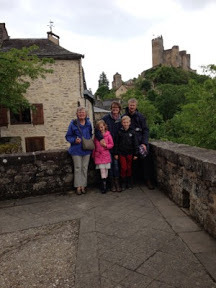 Najac is gorgeous - a medieval town tumbling down the side of a ridge - describes this town very well. 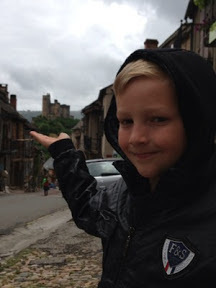 We walked along the road leading to the castle and the cathedral. Yet another beautiful cathedral. We all went in and admired the gorgeous floral displays and met the man who had done them. 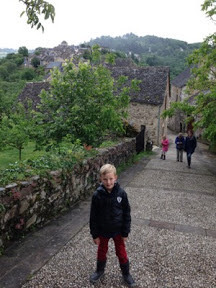 Hannah had a wee pray quietly in the pews and Jasper and Penelope lit candles for Grandad Bill who would have loved visiting his Grandchildren on their French adventure. We headed back to the car and the heavens opened and the rain came down. 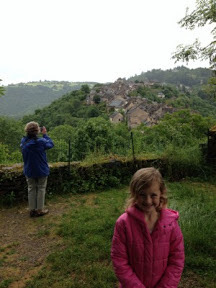 As it was now 5pm we decided to leave Cordes-sur-ciel and Albi for another day and head for home. A lovely day out yet again!